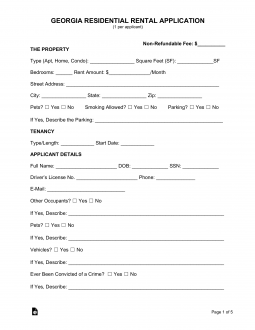 The Georgia Rental Application Form has been organized and composed to better serve landlords seeking a tenant to lease a property. This gives a property managers and landlords the ability to keep their search for a suitable tenant clean and organized. By using a standard application form that is dispensed as part of an application process. This can be quite a preventative measure when dealing with all sorts of people since, unfortunately, it is possible one may run across an applicant who is disgruntled or retaliatory should he or she believe they were discriminated against as a result of not qualifying for a rental. This form is compliant with the Federal Housing Act and Georgia’s landlord-tenant laws (Georgia Code Ann. 44-7) and utilizing such a standard method of gathering information will act as a bulwark against unfair accusations while gaining the information necessary from prospective tenants. From the tenant’s side, this application will deliver a more enjoyable application process since, it will greatly aid in presenting the wealth of information a landlord requires to make a favorable decision. There will also be a convenient signature line to give a landlord permission to run the necessary background and credit checks that will be required to complete the process. Step 1 – At the top of the page, report the property address that is being applied to. Also include the unit number of this property if it is applicable. Step 2 – The applicant should enter his or her full name on the appropriate blank line. Step 4 – The sections beginning with “Present Address” and “Previous Address” should also be filled out by the applicant. Next to “Present Address” enter the current address where the applicant lives. Then enter how long he or she has lived at this address, the reason for moving, the full name of the Owner or Property Manager of that property, and the phone number of that applicant. This information should also be reported for the address the applicant lived in before their current one. Step 5 – The next line will require the full name and the age of the other individuals who will be living with the prospective tenant. Step 6 – Below this the applicant should list if they have any pets. Step 7 – Next will be the employment information. Some applicants may have two jobs to cover the rent while others may need to report a roommate’s income to cover the rent. In either case this should be placed in a separate document, attached, and signed by the applicant. First, fill out the name of the current place of employment next to “Present Employer.” Below this enter the full name of the supervisor. There will be a space next to both of these items so that a phone number for each may be entered. Finally report how long you have been working with this employer. This process should be repeated for the last place the applicant worked in before their current employer. Step 8 – Next enter, the current income before taxes are taken out. Do this beside the words “Current Gross Income Per Month (before deductions). If there are other sources of income this should be reported directly below. The last line of this paragraph is reserved for alimony/child support monies. There will be a space for any that is received or if the applicant must pay, there will be a space for this. In each case, enter a dollar amount if it is applicable. Directly following these lines will be a space for self-employment income and the specifics involved. Note: Applicants should be prepared to prove any earnings gained through self-employment. Step 9 – The next several lines will be where financial information is reported. First enter the name of the bank where your savings account is held, enter the branch number and the last four digits of the account number held there. Step 10 – Enter the name of the bank where your checking account is held, the branch number, and the last four digits of your account number. Step 11 – If you have a credit card, enter the name, last four digits of the account held, the balance you owe the credit card company and the monthly payment amount. Step 12 – Finally, enter the name of your credit reference. This should be followed by the last four digits of the account number held, the balance you owe, and the monthly payment amount. Step 13 – Now that the current specifics on your financial status has been entered there will be a section for financial history. This section will begin with the words “Have You Ever.” These questions will be yes/no answers regarding bankruptcy, eviction, felony convictions, dispossessory notices, if one has ever been asked to leave a residence, and if one is on parole. If the answer to any of these questions is yes, then write out an explanation on a separate document then sign, date, and attach it. Step 14 – The next section will be a vehicle inquiry. For each vehicle owned, enter the make, model, year, and license plate number. Make note that no more than two vehicles will be allowed to be owned by a tenant and that storage of campers and trailers will not be permitted. Step 16 – The final step of this application will be a signature and date of signature. The applicant should be aware this signature line is also a consent line to give the landlord or property manager permission to conduct a background check and a credit check. **Note: the following page will be a series of blank lines for any information that would not fit on the application itself. If this is not enough room, the applicant should continue on a separate page then sign and date that page.